manila fashion observer: ROOTOTE's Snapshots Promo! 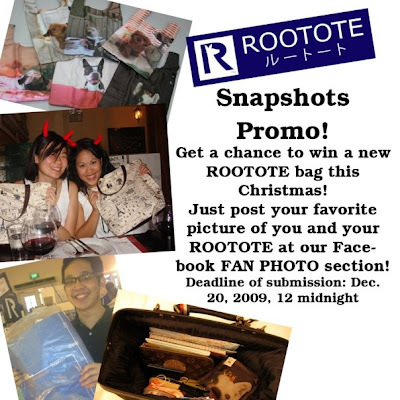 ROOTOTE is spreading the holiday vibes this season with ROOTOTE's Snapshots Promo where three lucky fans get a chance to win a new ROOTOTE bag! How? Get your ROOTOTE bag and take a picture of yourself with it! Then, email your photo to roototephilippines@gmail.com! Deadline of submission is on December 20, 2009, 12 midnight. Winners will be announced on December 24. For more details, check out the site or the Facebook fan page!